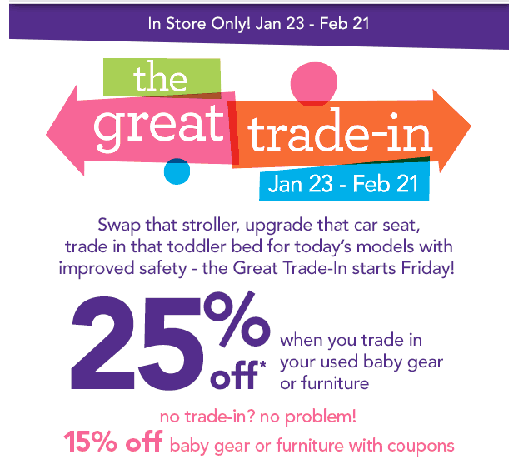 Babies R Us is hosting their Great Trade-In event again and it starts this Friday. This is a great way to bring in used baby items (strollers, car seats, etc.) for recycling and get great coupons in exchange. I traded in an old car seat last year and received two pages of store coupons. One coupon was for an additional 50% off the super clearance prices they had. I scored lots of clothes and PJs for next to nothing. I can’t guarantee what coupons they will hand out this year but I do recommend trading in at the Babies R Us in Latham for the best selection, especially on clothing (they carry up to size 5).